“I’m fit as a fiddle,” Nagaoka told media in an interview after completing the 400 metres freestyle in 26 minutes, 16.81 seconds at a Japan Masters Swimming Association competition in Chiba, on the outskirts of Tokyo. “The secret is to eat well and stay active. It’s no good sitting around at my age. I want to keep swimming until I’m 105 ─ and beyond that,” added the Yamaguchi native, who has lived through 22 Olympics to date. “It was just another race,” smiled Nagaoka after changing into a pink jacket and matching hat. “Swimming makes me happy, that’s what I love about it,” she added. 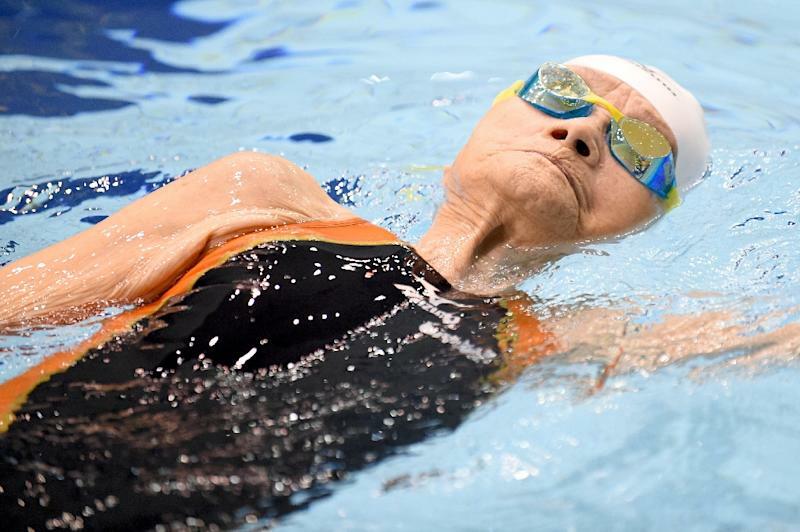 “When I’m swimming I’m in my own little world.” Along with 105-year-old sprinter Hidekichi Miyazaki, another geriatric record breaker, Nagaoka is blazing a trail for Japan’s turbo-charged pensioners in a country with one of the world’s highest life expectancies. Nonetheless, Nagaoka’s time was well outside her world record of 16:36.80 set two years ago. Her rivals had long dried off and were talking by the side of the pool when Nagaoka finally touched to thunderous applause. But she struck a defiant tone. 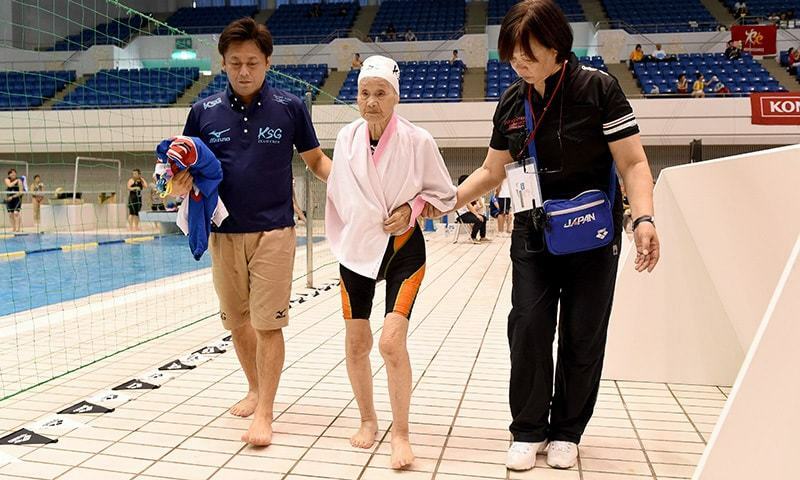 “I want to keep swimming as fast as I can,” said Nagaoka, who owns world records in the women’s 100-104 age division in nine events, including the 1,500m freestyle ─ a distance most people of her venerable age would struggle to walk. “Her attitude to life is totally scandalous,” said her 76-year-old son Hiroyuki. “She refuses to live life by the correct rules. She eats only the finest food and turns her nose up at anything she doesn’t fancy. “You’re supposed to slow down with age, but she was getting quicker with age in her nineties, breaking record after record,” he added. “That sense of joy and purpose in life is the secret to her long life.” Nagaoka still trains three times a week in Yamaguchi, south-west Japan, under the tutelage of long-time coach Shintaro Sawada. 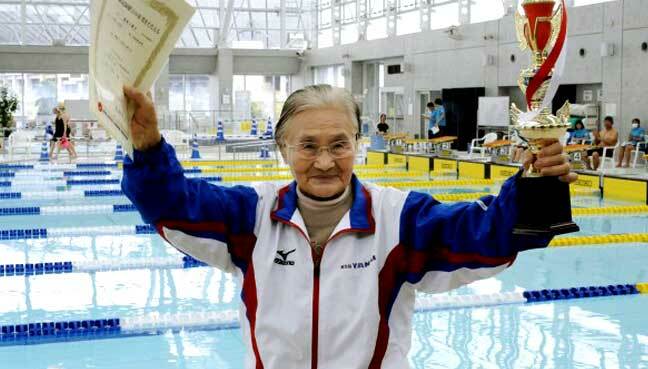 “At first, I thought she was joking about swimming until 100, but she was deadly serious,” said 41-year-old Sawada.